Vibrant hues of yellow from the canola plant, decorate a field during the summer months in the Blue Mountain District in Ontario, Canada. A field adorned in bright yellow flowers known as Canola grows across the landscape in the Blue Mountain District of Ontario, Canada which is a very important crop used in the agriculture industry. Canola is one of two cultivars of rapeseed which is used to produce edible oil for humans, animal feed and biodiesel. The name canola originated from "Canadian oil, low acid" in 1978 and was once considered as a specialty crop throughout Canada but today is a major crop across North America. 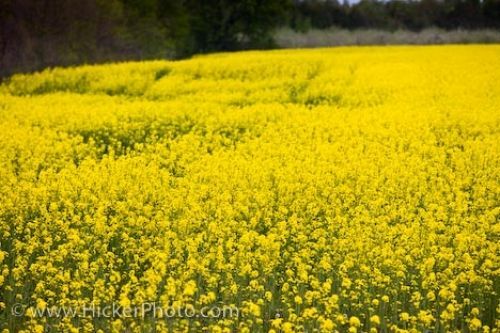 Bright yellow canola blooms, Brassica napus, in the Blue Mountain district of Ontario, Canada. Picture of the bright yellow field blossoming with Canola flowers in the Blue Mountain District in Ontario, Canada.